Tiny House Living addresses many relevant questions that we face today: downsizing as an individual, minimizing ecological footprints, current refugee debates and problems of gentrification. 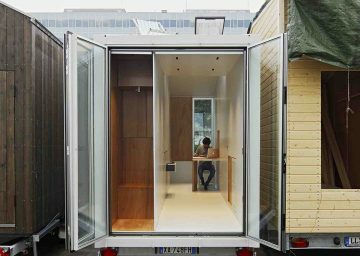 The two Tiny House prototypes aVOID and 35kubikHeimat are small houses on wheels and offer not only an individual living space, but a temporary platform for discussion in public spaces. These prototypes come to Munich, where rents are drastically increasing which can address the controversial question of who owns the city? Bauzentrum at Messegelände and Pinakothek der Moderne, located in the city center, will be offering a plethora of events during the first week after Easter. Participating companies will present an array of different events such as hands-on workshops, "How do I build my own Tiny House", guided tours, water systems or how to cook in a tiny home. The exhibition offered in the tiny home is about a new book project called "Touristic Places in Winter,” curated by Katharina Kreye, founder of the 'Verlag für spezielle Allgemeinheiten' which exemplifies characters of locations amidst the living room. Here it is shown how functions of daily life stay invisible behind flaps, doors and drawers when they are not in use. The Tiny Houses offer open spaces, freedom and undefined areas which open up a room even if it is ever so small. The Tiny House ist located outside the Pinakothek der Moderne, Türkenstr. 14. April 5 | 3 - 6 p.m.
April 6 | 10 a.m. - 1 p.m.
April 8 | 12 p.m. - 4 p.m.